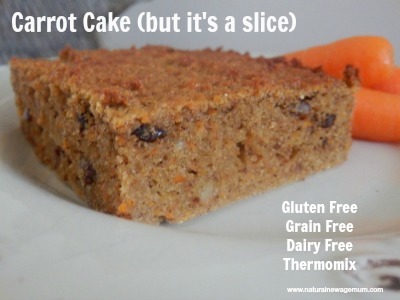 I had a heap of organic baby carrots in my crisper, so I thought it would be a perfect time to make a carrot cake. Except it sort of turned into a slice! It’s so much easier to pack into lunch boxes when cake is cooked in a slice tin. This recipe at the Paleo Mom inspired me to use tapioca flour with the coconut flour instead of just coconut flour like I usually do. I must say I do like the texture and mouth feel it gives. So if you are not keen on coconut flour, try it with the tapioca. Our co-op gets an organic tapioca flour from Organic Road. Put the oven on medium – 180ºc. Peel your carrots, roughly chop and whack into the thermomix. Blitz on speed 5 for 4 seconds. Scrape down and add in all the other ingredients except the sultanas and walnuts. Whizz on speed 5 for five seconds. Scrape down. Add the sultanas and walnuts. Mix on reverse, speed 4 for 5 seconds. Whack it all into a baking paper lined slice tray. Bung it in the oven 25-30 minutes or until cooked. Cool on a wire rack and slice into squares to serve. You might like to try some of these icing recipes or just spread with a nice smear of organic butter. If you don’t have a thermomix: Grate the carrots, whisk the eggs and then mix all ingredients together gently in a large bowl. HOT TIP: You may like to double the maple syrup. My kids thought it wasn’t sweet enough, but I thought it was! I have a recipe for apple and carrot muffins. I might give it a go with this gluten free version for a change, and sub the sultanas (which my kids don’t like) for the grated carrot. Can’t wait to try it. I think they would make awesome muffins too! 🙂 Let me know how it goes! I love quick and easy!! Mix, whack into tin, bake !! Perfect. It’s in the oven now! Just made it and its delicious. I added a handful of choc chips too but only 3 tbs of honey. My 3 yo is devouring it! What would be a good sub for tapioca flour? More coconut, plain or wholemeal? Coconut flour is such a tricky flour! You could try some plain flour! Delicious, I don’t own a thermomix but just whizzed it all up in the blender. Tastes great! Thanks. Do you think this would work as apple and blueberry instead of carrot and sultana? My sons daycare is nutfree including coconut, what could I use in place of the coconut flour? Devastated I can’t make all my coconut flour goodies any more. sorry Rochelle, there are no direct swaps for coconut flour – it’s such a funny flour to work with – it would just be trial and error! Let me know what you think Margarita!